KonaKart has a rich feature set to provide your customers with all of the information and functionality required in order to shop at your on line store. KonaKart has a rich feature set to provide your customers with all of the information and functionality that they require in order to shop at your on line store. Fast indexed search caters for misspellings, synonyms, plurals, phonetic matches and alternate spellings. Intelligent suggested search immediately displays a list of items, categories or manufacturers matching the letters that you’ve typed. Product Tags such as screen size for TVs or megapixels for digital cameras. Product features can be compared against the features of other similar products. This is especially useful for technical products with many variations such as mobile phones and digital cameras. Gift registries such as wedding lists can be searched for using a variety of search parameters. A panel keeps track of recently viewed products so that a customer can quickly find a product he recently looked at. Products may be saved within a wish list even for unregistered customers or registered customers that haven’t logged in yet. Just in case a customer is still undecided, he can be shown a list of similar products (cross-selling) or a list of top of the range similar products (up-selling). Studies have shown that to reduce cart abandonment, even unregistered customers must be shown the final price that they will be charged. The KonaKart shopping cart details screen shows the order total for all items in the cart, and also shows the shipping charges, applicable taxes and any promotional discounts that may be applicable to the cart contents. This complete picture is more likely to convince a customer to proceed to the checkout process since he is now confident that there are no extra hidden charges. If the customer were to abandon now, the cart items are not lost. Information is stored in a cookie so that next time a visit is made, the cart will still contain the items added during the previous visit. Now that, the customer has decided to purchase the items in his cart, the checkout process should be as simple and efficient as possible. KonaKart can be configured to require registration for checkout, or to allow a customer to checkout without registration. KonaKart has a single checkout screen which appears when the checkout button is clicked. It uses innovative AJAX technology that allows the customer to change details of the order such as the coupon code or shipping option, and immediately see updated order totals without a screen refresh. If for example a customer modifies the shipping address and this changes the applicable tax and shipping charges, these are updated automatically as soon as the new address is saved. KonaKart allows you to reserve products during the checkout process to avoid selling products that aren’t in stock. Customers can view their order history and order statuses and download these in PDF format. Customers can resubmit orders with a single click. Customers can maintain their accounts. They have an address book for multiple shipping and billing addresses. There is a permanent shopping cart for customers so that items added to the cart remain there even after a customer logs out. If a customer finds an item that he would like to buy, he can add it to a wish list to avoid searching for it again next time he logs in. The KonaKart API supports multiple named wish lists for each customer. Gift registries such as wedding lists can be created and maintained by registered customers. Any customer can search for public gift registries and purchase items from a registry, which may be shipped to the address defined by the registry owner. Customers can write product reviews to share their experiences with others. Customers can save page setup preferences such as the number of products, orders and reviews displayed on a page. Customers can subscribe to products to receive related emails/newsletters. For example an email could be automatically sent to all customers that have registered for a product, to inform them that the product is now in stock. All emails are template driven and so fully customizable using the Apache Velocity template language. In today’s global economy, we realize how important it is for you to reach out to customers residing anywhere in the world. KonaKart is completely multilingual, (supporting both Western and Asian character sets) as well as being multi-currency. The wording on the store front and the product descriptions can be written in multiple languages in order to allow your customers to dynamically switch to the language of their choice, or for you to automatically present them with the correct language based on their region. The language of the administration application may be changed dynamically by selecting the appropriate language from a drop list. The KonaKart database supports different currencies and all of the locale information required to display the currencies correctly on the screen. A default currency may be configured by the administrator. A customer using the store front application, may dynamically switch between different currencies. For special cases where store data has to be kept within separate DB schemas, KonaKart can be configured to achieve this, although some of the functionality such as the sharing of customers and products described above, is not available in this mode. Vendor company information can be managed by KonaKart and customers can write reviews for vendors. The vendor details, average vendor rating and the vendor reviews can be viewed from the storefront application. Customers may be placed within a hierarchical structure where a customer can be assigned a parent and children. This is useful functionality for a group of corporate buyers that may want to share information such as orders and that may have roles so that a parent in the hierarchy needs to approve the orders of a child. KonaKart supports an unlimited number of catalogs that may define product prices, product availability and product stock. Each B2B customer may be allocated a catalog that includes a subset (or all) of the available products with personalized prices. Can a buyer enter a new address for an order? Does a buyer have a limit for the order amount? Does a buyer have a monthly order limit? Can a buyer view the orders of other buyers? A customer type of B2B Customer Administrator can manage all B2B users for his company, directly from the storefront application. He can create, update, disable, delete users and define their roles such as whether they have an order limit or their orders require approval etc. KonaKart has been designed to cater for a wide range of products types in order to satisfy your business requirements. It supports the packaging of products into bundles and also the sale of digital download products which can be downloaded from the store front after payment has been received. Gift Certificate products may be defined and associated with any type of promotion to provide the discount. The Standard type is where each option value defines a product attribute which may or may not modify the price of the product (e.g. Small, Medium and Large for an option called Size or Black, Brown and Red for an option called Color). The Customer Text type option allows a customer to enter text which for example could be used to personalize the product with a name, initials or a greeting. The Variable Quantity type is an option, the value of which may take a customer defined quantity. It can be used for example to specify the required amount of disk storage required when configuring a cloud based computer. The Customer Price type allows the customer to enter a price for the option. This could for example be used for making donations. In order to entice a shopper to buy a particular product, it helps to display multiple images taken from different angles. KonaKart allows you to store multiple images for a product. Product options may also have images associated with them, so that the images change as a customer selects an option such as color. Each product may be associated with multiple prices. The actual price displayed can be controlled by the customer group, so that you can display different prices for say, wholesale and retail customers. It may also be controlled by the store id if a product is shared between multiple stores. An unlimited number of prices may be achieved by storing the prices in a separate database table and selecting them based on the identifier of the catalog containing the product. When in this mode, each catalog may also contain the product quantity and its available date if it is currently out of stock. KonaKart also supports a special or sale price and tier pricing based on the quantity ordered. An unlimited number of custom attributes may be created for a product, enabling you to define a wide range of products with completely different characteristics. The custom attributes may be grouped into templates to make it easier when inserting products since the product only needs to be associated to the template rather than to every custom field individually. Each custom field has associated metadata, defining things such as the widget and validation for editing in the admin app and data type and template so that it may be displayed correctly in the store-front application. An unlimited number of miscellaneous items may be associated to a product. These maybe for example, documents or videos. Each miscellaneous item is categorized into a type. Each product may contain structured data as well as a description. The structured data can be used for comparing product features. This is particularly useful for comparing products that may contain many options, such as digital cameras and mobile phones. KonaKart includes an import/export tool to efficiently load products into the database from a file, and to create a file from the products in the database. A product may be defined as a digital download. When such as product has been paid for, a download link appears in the customer’s private account page so that it may be downloaded by the customer. The download link can be set to expire after a number of days or after a number of downloads. Digital Download .txt and .pdf files may also be indexed in the search engine, and text fragments (snippets) surrounding the search keywords may be returned so that the context of the search result can be determined. Sometimes it is useful to package two or more products into a bundle which is sold as separate item. KonaKart allows you to package any number of products into a bundle. The quantity in stock is calculated automatically and tools are provided to calculate the cost (with optional discounts) and the weight. The quantity in stock of each component within the bundle is decremented automatically when an order is processed. Gift certificate products may be created. You can choose to create a new product for each value or define different values as product attributes. In order to calculate the discount given by the certificate, it is associated to a promotion. This allows you to easily create specialized certificates that are valid for only certain types of products or customer groups etc. Once a customer buys a certificate, a code is generated which can be used to activate the certificate during the checkout process. This code may be downloaded as a digital download or it may be sent to the customer in an eMail or through regular mail. Tags are attributes that can be associated to a product and can be used to refine product searches (faceted searching). For example, in the case of a digital camera we could define tags for Mega Pixels (6.0, 8.0, 10.0), Optical Zoom (3x, 4x, 5x) and Weight (less than 100g, greater than 100g). When searching for a product, a shopper can select any number of tags to find only those products matching all of his requirements. A virtual product is a product that doesn’t ship and isn’t downloaded. It may be used for services like extra warranty or 1 hour of tuition etc. KonaKart has been engineered to manage product catalogs containing hundreds of thousands of products. In order to search for these products in an efficient manner, KonaKart may be configured to use the Apache Solr enterprise search server based on the Lucene Java search library. This powerful technology not only provides for a lightning fast search experience, but also incorporates intelligence to correct common problems such as misspellings and plurals which often frustrate shoppers making them go elsewhere. For example, the words Television, Televisions, TV, TVs can all be configured to find televisions. Without any specific configuration, a list of spelling suggestions of words that exist in the catalog are displayed to the shopper. It may also be configured to provide phonetic searches in order to find words which sound like the search keyword. KonaKart allows a configurable way to use the powerful faceted search functionality of Solr by allowing different facets to be defined for different product types. The facet information returned by SOLR contains quantity information with the most popular items at the top of the list. Each term is indexed with metadata containing the category, product and manufacturer ids so when a customer clicks on a term such as “Sony in Televisions” he is directed to a category view, displaying Sony products within the Televisions category. At this point he can choose another manufacturer remaining within the category and / or can apply extra filters such as screen size, LED, LCD etc. if the category has been set up with product tags to allow faceted search. The Enterprise version of KonaKart supports basic Content Management features that may be sufficient for some store owners who don’t want to integrate with a sophisticated Content Management System for more advanced features. KonaKart allows you to define “Content” objects which can be anything you like including blocks of text, images and clickable banners. You can set up these content items in the Administration Application and access them via the KonaKart APIs to show in your storefront. Their use is demonstrated in the sample store that you get when you install KonaKart. Each content object contains an extensive set of attributes that can be used to program the storefront. Different content types require different attributes to be specified but there are very few mandatory attributes giving considerable freedom to use content in creative and flexible ways in the storefront. One of the powerful features of KonaKart content is the ability to select it programmatically by evaluating KonaKart expressions. You could use this feature to select appropriate banners or text for the particular customer browsing the storefront. The purpose of the KonaKart Messenger Bot is to help customers find products managed by a KonaKart store, using the Messenger interface. The bot goes beyond simple keyword searches and uses the wit.ai artificial intelligence engine to attempt to understand certain message types (intents) and to respond accordingly. Full source code is provided allowing you to add your own bespoke functionality. The Messenger Plugin module allows you to enable a Messenger chat window directly from the storefront application. Include or exclude customers belonging to customer groups. This could allow you to make a promotion available only to retail customers or only to students etc. Include customers whose customer tag values return true from an expression. (See the marketing section for an explanation of customer tags and expressions). All promotions may be configured to have a start and end date and to be used only a specified number of times. The promotions themselves are KonaKart Order Total Modules which can easily be developed and slotted into the KonaKart architecture. The source code of the available promotion modules is included in the download package. The promotion gives a discount on a product. The promotion gives a discount on the shipping costs for an order. The promotion is used to determine how many points to reward based on the value of the order. Since the promotion can be enabled / disabled based on a set of rules; multiple reward point promotions may be created that use different points multipliers based on the products being purchased. The promotion is used to determine how many points to redeem based on the value of the order. Since the promotion can be enabled / disabled based on a set of rules; multiple redeem point promotions may be created that use different points multipliers based on the products being purchased. This promotion is attached to a Gift Certificate product and generates the discount based on the value of the certificate and the certificate code. Using the promotion rules you may decide to enable / disable the certificate based on which products are being purchased. This promotion can be configured to provide one or more free products if a certain number of products are paid for. i.e. 3 for 2 which means that if two products are bought, then the 3rd one is free. This promotion adds a free product to the order. The free product to be added is defined in a configuration parameter of the promotion. For each product a user can see what other products were bought by customers who bought that product. This encourages the shopper to keep on shopping with some useful suggestions on what to buy next! Global best-seller lists and context sensitive best-seller lists showing only products from the current category, give a customer insight into what others are buying. If the customer’s choice happens to be a product on the list, he is more likely to go ahead and buy without doing further product analysis. Not all customers are created equal! Sometimes it is convenient to categorize customers into different groups. For example, your on line store may cater for both wholesale and retail customers or you may wish to offer more favorable terms for students or employees of your company. Control what prices are displayed to customers within a particular group. Customers from different groups may be shown different prices. Enable promotions. Promotions may be enabled only for certain types of customers. e.g. You may want a 3 for 2 promotion to only apply to your retail customers. Send communications. You may send out bulk emails only to customers that belong to a particular customer group. 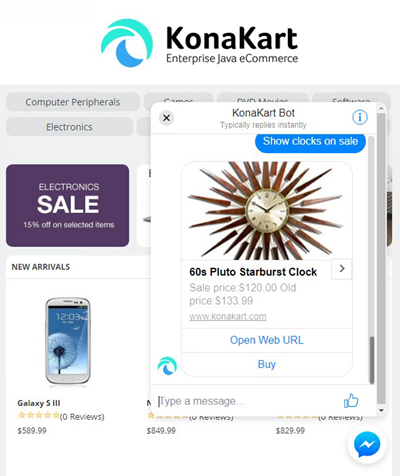 The Enterprise version of KonaKart contains sophisticated marketing functionality that allows you to capture customer data as the customer uses your KonaKart eCommerce store; and to use that data within complex expressions in order to show dynamic content, activate promotions and send eMail communications. The data is captured in customer tags such as CART_TOTAL, CATEGORIES_VIEWED, PRODUCTS_IN_CART, PRODUCTS_IN_WISHLIST, SEARCH_STRING etc. as the customer navigates through the store front application. New tags may be created to match business requirements. and only show the banner when the expression evaluates to true. As well as displaying dynamic content, expressions may be used to filter a customer list when sending eMail communications and also to introduce extra rules for promotion usage. The Enterprise version of KonaKart supports reward points which enable you to increase customer loyalty and increase sales by rewarding customers for purchases as well as other actions such as registering, writing a review, referrals etc. During the checkout process, points may be redeemed for discounts up to the total value of the order. The allocation of reward points can be associated to a set of rules so that points are allocated only for the purchase of certain products or only to customers belonging to a particular customer group or satisfying expressions based on customer tags. When a customer logs into the store front application he can view a statement of his reward point transactions and he always has available the total number of points that he can spend. The administrator (through the Admin App) can view the reward point transactions for any customer, and has the ability to add and delete points from the customer’s account. In a similar fashion to the awarding of points, the redemption of points can also be associated to a set of rules. This enables you to only allow redemption under certain circumstances such as when an order reaches a predetermined value or for example make points worth more for certain products. KonaKart provides support for recurring billing which may be implemented in one of two alternate ways. The actual payment transactions may be performed by a payment gateway that supports recurring billing, or they may be performed by a KonaKart batch program that interfaces with the payment gateway to make the regular payments. The current KonaKart installation package also contains shipping modules for UPS, USPS and for FedEx. KonaKart has been designed to easily accept new shipping modules which may be developed in house, by a KonaKart solution provider or directly by the KonaKart professional services group. KonaKart contains Search Engine Optimization functionality to ensure that your on line store and products are indexed by search engines such as Google and so easily found by customers. Rest assured that shoppers will find your KonaKart based store ! XML Sitemaps are an easy way for to inform search engines about pages that are available for crawling. KonaKart includes a Sitemap generator which may be scheduled to run at regular intervals in order to keep your Sitemap up to date. In order to maximize the revenue from your on line store, you need to understand how your customers are using it. Analytical tools give you insight into where your customers are from and how they are using your web site. KonaKart has Google Analytics built in, so that you can monitor your on line store without having to do any extra work. Google Analytics makes the features that experts demand, easy to use for everyone, allowing you to gain rich insights into your website traffic with Advanced Segmentation, Custom Reporting, Motion Charts, and more. Due to the way analytical reporting is integrated within KonaKart, it is easy to include any analytical tool that requires inclusion of Java script code within all pages of the store. Customer Events can be defined to save important event information that may be used for reporting purposes. For example, events may be inserted whenever a product is viewed or removed from the cart or when a customer starts and completes the checkout process or aborts it. Events may be written to another database rather than the production database in order to not impact production performance. All events are written to a local in memory queue which is emptied by a separate thread so that the insertion of events never becomes a performance bottleneck. You may use your favourite Business Intelligence tool to inspect the data and provide information such as the number of carts abandoned in the last, hour, day, week, month and year. Social Login allows customers to sign into KonaKart using credentials from a social networking service such as Facebook, Google+ or PayPal. It is designed to simplify the registration and login process since customers are not asked for a KonaKart specific username and password.